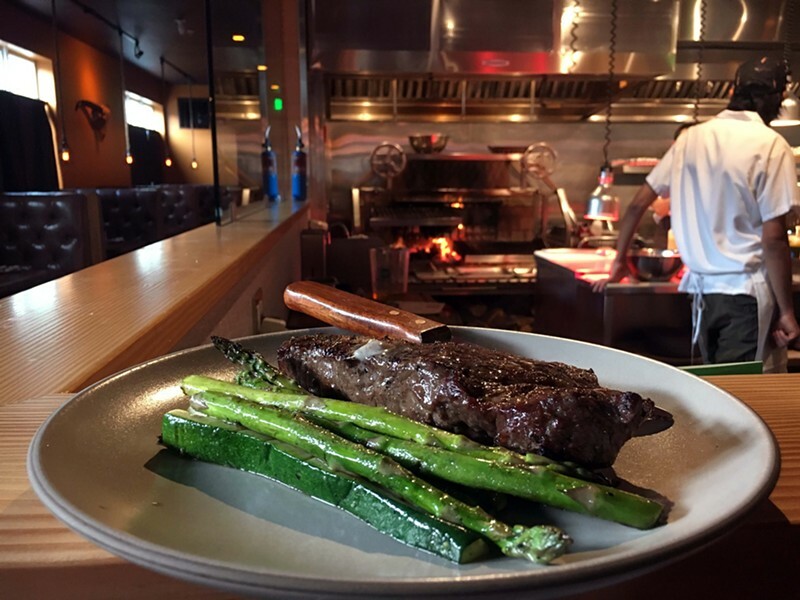 The New York strip steak, grilled vegetables and a counter view of the fire. Going for woodland chic in Humboldt risks redundancy but the vibe at Campground (865 Ninth St., Arcata), the landlocked cousin of Salt, is a bit more Swedish cabin hotel, with its deconstructed forest of birch stalks separating the bar from the tables and the homey blue and white tile flooring. Blackout curtains obscure the Bret Harte Alley view from booths with caged lightbulbs suspended from ropes in rustic imitation of something your grandpa hooked up in the basement. The redwood tattoo on the forearm of the young man prepping vegetables just over the back counter is probably just a coincidence but it's on brand. A glass fridge stocked with aged beef in the corner is promising, as is the fire in the back of the open kitchen, crackling and spitting embers up through the grill, a stack of firewood on deck below. Billed as an "Argentine-inspired steakhouse," the fire is the star of the show. What to order from the all à la carte menu? 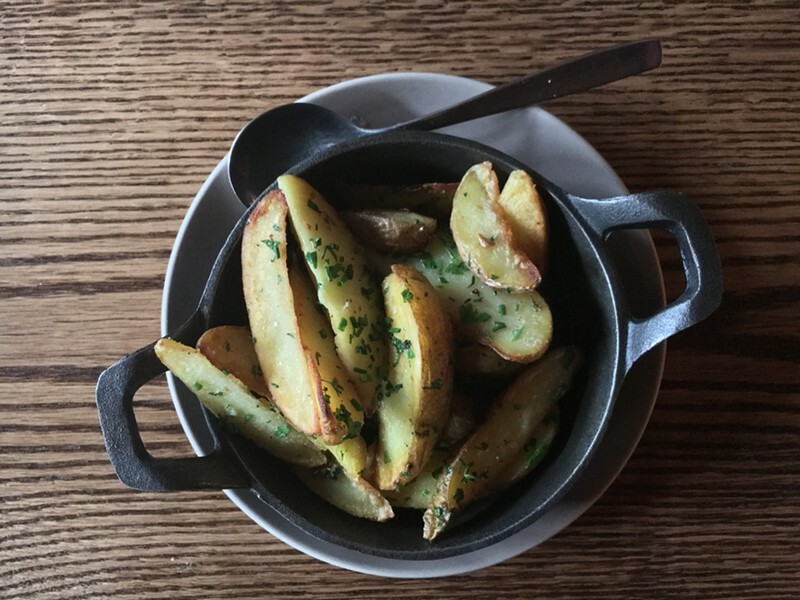 Slim wedges of beef tallow potatoes ($7) arrive sprinkled with parsley and chive in a little cast iron pan. A true rival to French fries, they are perfectly salted, soft inside and rich with the promised beef fat, which also yields a just-crisp exterior. There’s a reason McDonalds worked so hard to replicate the flavor of beef fat for its fries — oil is no substitute. The 10-ounce New York strip steak. 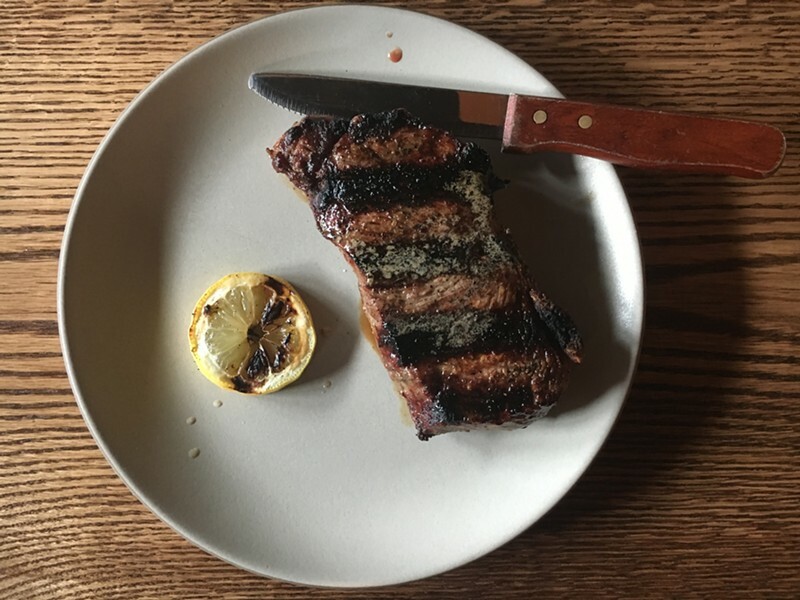 The 10-ounce New York strip steak ($27) gleams with garlic and truffle compound butter, though the taste is squarely about the tender meat and the wood fire char that makes a wonder of its marbling and rind of fat. 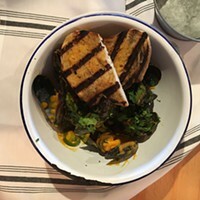 On a recent night, the grilled seasonal vegetables with roasted garlic vinaigrette included bright, glossy asparagus and zucchini with a perfect bite and a hit of woodsmoke ($6). 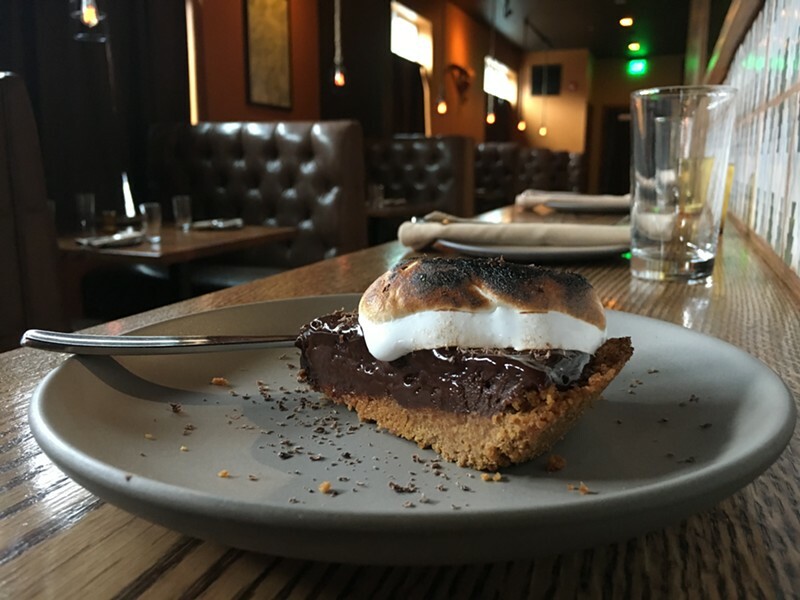 A wedge of s'more pie. Are you going to eat someplace named Campground and not order the s'more pie? You are not. The hefty graham cracker crust and velvety ganache filling are topped with a dollop of marshmallow cream that's been torched to sleep-away camp toastiness. And you didn't even have to pack a sleeping bag.